With your Link-Belt distributor, your crane investment is always protected. When you invest in a Link-Belt crane, you also invest in a legacy of more than 130 years of outstanding customer support. With the world-wide Link-Belt distribution network, you are never far from quality Link-Belt service or parts professionals. The value of a machine starts with state-of-the-art design and manufacturing, but excellent product support determines its long term value. And, thinking to the future, it’s good to know that Link-Belt cranes traditionally command some of the highest resale prices in our industry. Link-Belt Preferred gives Link-Belt crane owners instant access to vital information via the web. All technical publications, including parts pages, service manuals and operator manuals for virtually every Link-Belt working crane are available on-line through Link-Belt Preferred. Current literature can also be found at this customer-focused site. Measure the Link-Belt Difference when it comes to providing instant, accurate information for Link-Belt crane owners anywhere in the world. At Link-Belt, we have the right people, ready to deliver the right part, at the right time. No one knows your Link-Belt equipment better than our trained Technical Specialists and no one provides faster, more efficient customer service than our customer service representatives. Our online computer system allows distributors worldwide to order Genuine Link-Belt Parts 24 hours a day, 7 days a week. 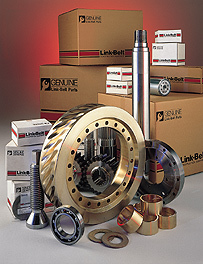 An integral part of Link-Belt’s product support is the maintenance of an extensive and well planned parts inventory in our dedicated 72,000 sq. ft. Parts Distribution Center. All parts in stock ship the same business day. A commitment to highly trained, experienced service personnel is demonstrated throughout the lifetime of your Link-Belt crane. Highly trained and motivated field service personnel are prepared to respond to your downtime and get you going...FAST. Supporting these distributor personnel are experienced factory advisors with comprehensive machine records, CAD computer terminals, and technical publication libraries on the web to isolate the facts and quickly resolve crane service issues.